BERJAYA Group Bhd (BGroup), the main listed holding company for the assets of Tan Sri Vincent Tan, has finally received all necessary approvals to complete its plan to restructure its group of companies. “After obtaining approval from all our shareholders, we can act on our plan and expect the new structure to be in place by November,” Berjaya Sports Toto (BToto) and BGroup executive director Freddie Pang Hock Cheng told StarBiz. He said this exercise, which involved the creation of a new holding company, would benefit all companies in the group. “Mistakes have been made, and the current structure is very complicated with many inter-company loans and debts. We want to clean up and pay off BGroup's debts much like how Berjaya Land Bhd (BLand) is paying off its debt to BToto,” said Phang. BLand is selling a 25.7% stake in BToto to Intan Utilities, another company owned by Tan. On BLand's reduced stake in its profitable subsidiary, Phang pointed out that repayment of BLand's inter-company loan would reduce its interest expense by RM77mil. “Although BLand will no longer receive as much in dividends from BToto, it (BLand) benefits from interest savings. It's really a win-win situation for BLand and BToto,” he said. The Berjaya group’s restructuring exercise that starts by transferring BGroup's balance sheet into a new company Berjaya Corp Sdn Bhd (BCSB) is intended to settle its RM3.1bil inter-company loans and RM758mil bank borrowings without any significant cash outlay. According to Phang, this approach was selected as re-capitalising BGroup to BCSB is confined to shareholders, warrant and Iculs (irredeemable convertible unsecured loan stocks) holders only, therefore allowing the paid-up capital to retain its current value and not causing its creditors “undue concern”. BGroup’s new simplified structure is expected to have an improved net tangible assets (NTA) and gearing value as well as a new source of income when BCSB fully acquires Bukit Tinggi Resort (BTR) from Tan. “Selling (BTR) at a price lower than its value shows shareholders that Vincent Tan is still very dedicated to his companies,” said Phang, adding that the tycoon had also personally committed more than RM1bil worth of assets to the new restructured group. Re-capitalising BGroup into BCSB entails the exchange of BGroup shares, warrants and Iculs with new BCSB securities. This exchange is based on the last traded market price of BGroup’s securities prior to its restructuring announcement back in August 2003. Every five BGroup shares or 20 BGroup warrants will be exchanged for one new BCSB share while three RM1 BGroup Iculs can be converted into two 50 sen BCSB Iculs. Upon completion of this scheme, BGroup will be a wholly-owned subsidiary of BCSB and will be de-listed from the main board of Bursa Malaysia. Its listing status would be than transferred to BCSB. The next step for BCSB is to settle BGroup’s inter-company loans and bank borrowings by offering its shareholders, bank and subsidiary companies, subscription to its Iculs rights. Shareholders holding five shares or five Iculs after the restructuring exercise will be entitled to subscribe to four BCSB Iculs rights and will also receive 0.27 units free for every successful subscribed rights issue. Assuming all rights are fully subscribed by shareholders, BCSB will raise RM283.6mil, whereby RM101.8mil and RM130.2mil will be allocated for partial repayment of bank borrowings and its Berjaya Capital Bhd (BCap) loan, respectively. BCSB will also issue up to 1.46 billion new Iculs to the AmBank group to settle its liability of RM656mil. To settle BGroup's inter company loan, it will offer 4.1 billion Iculs to BLand and 3.7 billion Iculs to BCap. 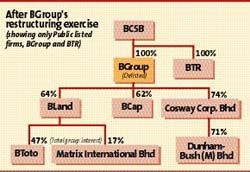 BGroup currently owes BLand RM1.62bil and BCap RM1.57bil. This proposed rights issue offers a 4% return for AmBank, BLand and BCap based on a nominal amount of RM1.27 Iculs for each RM1 debt. BCSB will then resolve BGroup's commitment to Bland. BGroup had previously agreed to buy BLand Iculs but had been unable to meet its obligation. As part of its inter company settlement, BLand will receive an additional 579 million BCSB Iculs as full compensation. As Phang had pointed out, BCSB will purchase Bukit Tinggi Resort (BTR) from Tan at the price of RM802.1mil, which represents a 16.5% or RM158mil discount from BTR's NTA value of RM960mil. BTR currently has a land bank of 15,000 acres with an open market value of RM1.35bil. “We expect the new structure to benefit from interest savings as well as BTR’s income contributions,” said Phang. BTR met its profit guarantee of RM100mil for financial year ended Dec 31, 2004.